Are you a fan of playing online casino games like roulette and blackjack, but finding that something's a bit…missing? Those virtual games are great, but sometimes you want to have a little human interaction, just like in an Aussie brick 'n' mortar casino. Well, that's where Live Dealer roulette games come in. Roulette Live Dealer games are unique to online casinos in that they feature a real dealer with a real roulette wheel who interacts with you via a webcam. It's fun and fast. In fact, it's just like being at a regular casino, all without leaving home! You can even talk and interact with the dealer! Live Dealer - The Future Of Online Casinos! 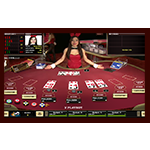 You do want a fast connection to play live dealer games as you’ll be streaming video. However, most broadband connections will be fine. Why play live dealer roulette online? Many prefer the interaction of a live dealer, while others worry about the lack of a random-number-generator (although some see that as an advantage as they prefer seeing a real wheel spin). Many of the real dealers are very friendly, so you can enjoy human interaction as you play. Another great feature of Aussie roulette Live Dealer games is that you can chat in real-time with your dealer in English. You type your comment into the chat box - whether it's a query about placing a bet, what the odds are, or even to ask the dealer what their favourite colour is - and the dealer will respond to you. Good roulette online Live Dealers are friendly and accommodating, even while they have a game to oversee, and most often ticking the boxes marked 'Attractive' and 'Female'. Hey, details matter, right? You don't want your connection to lag when you're trying to keep up with the dealer, obviously, so sort the broadband out first before even considering playing Live Dealer. Also, not all online casinos for Aussie players offer Live Dealer games, so you might find yourself having to set up multiple online accounts to play the games you're interested in. 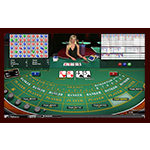 Live Dealer roulette has everything you would expect from the online game: a table layout, betting buttons, and a wheel to spin. Betting with a live dealer is identical to regular online roulette. However, you don’t decide when to spin the wheel. The live dealer does that. The position of the ball after the spin is announced by the software and the live dealer themselves. 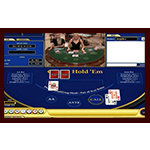 The rules of Live Dealer Blackjack are the same as your favourite online blackjack game - you are dealt two cards, and the aim is to keep drawing cards, or standing, and you must do your best to get a score of 21 or less (trying to get as close as possible to 21) If your score beats the dealer, then you win the hand. Where Live Blackjack differs, however, is that the dealer uses real cards to play, and cameras show you what you have been dealt. You can then watch the action unfold in real time, knowing the game is 100% fair. Everyone knows about the 'Cadillac of Poker, Texas Hold'em, but you might not know that there's a casino variety of the game, Casino Hold'em. Similar in some respects to the classic poker game, the game begins with players placing an Ante bet and an optional bonus side bet. The dealer and players then get dealt two cards each face down, and three community cards (the flop) are dealt in the centre of the table. A 'Call Bet' is then placed if you want to continue, followed by the final two community cards. It is then up to you to carry on betting in order to make the best 5-card poker hand using your seven cards. If you beat the dealer's score (as long as his initial two-card hand qualifies) you win. Hold'em lends itself perfectly to a Live Dealer scenario because, like Live Blackjack, you're taking the dealer head on. You can indulge in a bit of banter via the chatbox, and rub his or her nose in it if you win! Casino Hold'em is fast and fun, with big potential winnings. 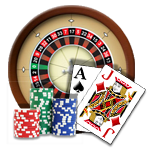 Baccarat is a classic casino game. In this game you challenge the 'bank' to see who can make the best two-card hand. In live dealer baccarat you get to see your opponent which is a lot more fun than playing against a faceless computer. This way, when you're dealt either a player, banker, or tie hand, you'll be able to see exactly what's going on and exactly whom you are competing against. We know what you are looking for: plenty of Live Dealer roulette online games, friendly, attractive dealers, and reliable video streaming. You also want fair, secure gaming. Our team has found online casinos that offer just that. We're the only choice for finding the best casino games for Aussies like you!